Coconut rice is a dish that’s very easy to make these days. 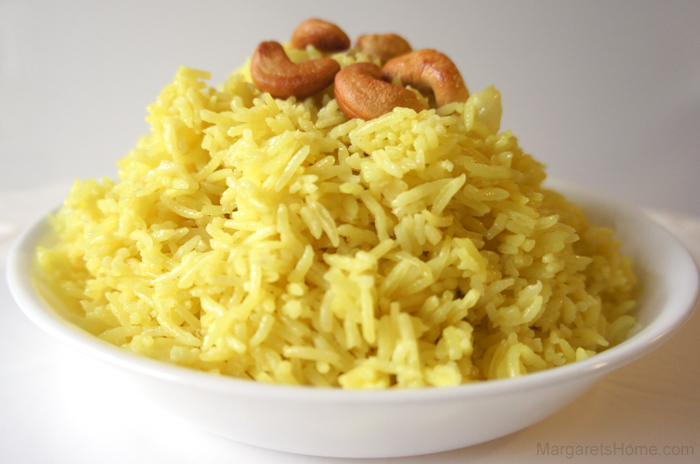 This is a recipe I’ve shared with a number of my friends who wanted an easy but exotic rice recipe from Indian. My colleague and friend, Elizabeth Oloo, likes this recipe and makes better coconut rice than I do! Many years ago, when I made coconut rice in India, just extracting the coconut milk was a cumbersome task. I had to first get a fresh coconut, grate it, extract the milk, strain it, and then start the process of making coconut rice. I only made it on special occasions – when I had plenty of time to spend in the kitchen. Now-a-days you can get coconut milk in a can. Oh, the joy of modern cooking! In a heavy bottomed pan add ghee. When it shimmers add the cinnamon, cardamoms, and diced onions. Sauté for a minute and when onions are transparent add the washed and drained basmati rice, turmeric and salt. Fry for two minutes. Add the coconut milk and two cups of water. Bring the rice to a boil then turn heat to low, cover the dish and let it cook for 15 minutes. Do not open the dish or stir during the 15 minutes. Turn off the heat and keep the rice covered until you are ready to serve. Fluff rice gently with a fork. 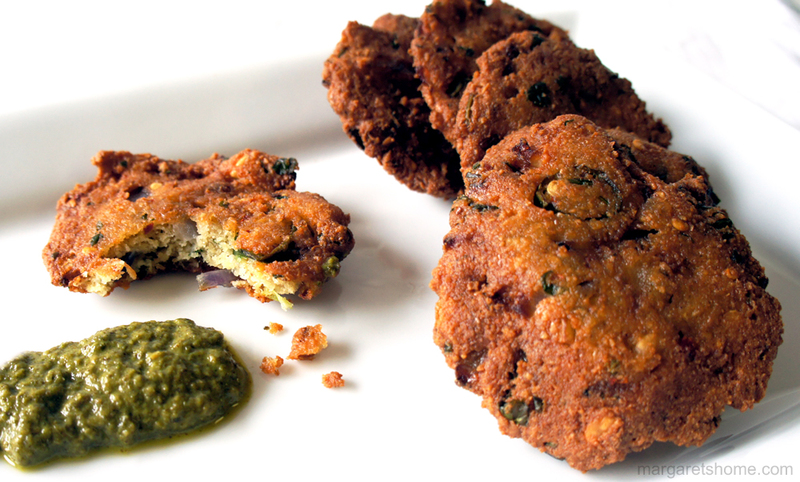 Garnish with fried cashew nuts and serve. Palak paneer is a popular North Indian vegetarian dish. When my friends and I go to an Indian restaurant, one of them always orders palak paneer. This recipe, my dear friend, is for you! 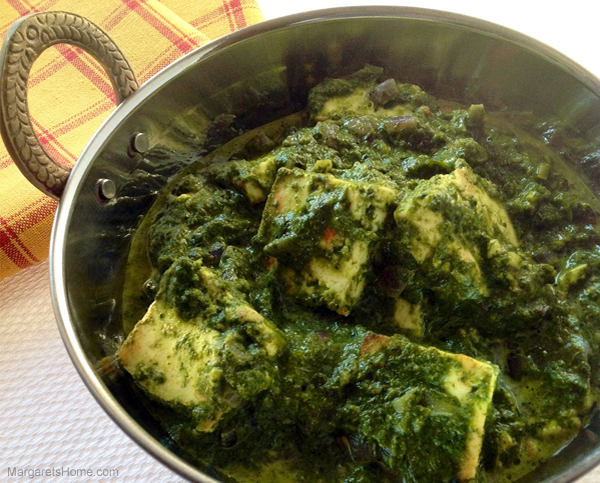 I have made palak paneer several times in many different ways, but this recipe is my favorite. Paneer can be bought at an Indian grocery store. I will share a recipe on how you can make paneer at home sometime soon. A word of caution, make sure that you adjust the number of green chillies depending on the amount of heat you can tolerate. Also, gently crush the dry fenugreek leaves with your fingers, before adding them. This makes a big difference in bringing out the essence of these leaves. Using ghee, dry fenugreek leaves (which is called kasoori methi in Hindi), yoghurt, nutmeg, and lemon juice elevated this dish and gave it a unique flavor. Wash the fresh spinach leaves, and put them in a large pot with three tablespoons of water. Cover and cook over medium-high heat for five minutes. Drain the spinach in a colander and then place it in a large bowl with ice water. This stops the spinach from cooking and helps retain its color. When completely cool, drain the water, and purée the spinach in a blender. Melt three tablespoons ghee in a medium sauce-pan over medium-high heat. Add cumin seeds and when they sputter add garlic and cook for 30 seconds. Add onions and salt; cook stirring frequently, until softened. Lower the heat to medium. Gently crush the fenugreek leaves, before adding them to the onion mixture. Add green chillies, coriander powder, turmeric powder and grated nutmeg. Cook, stirring constantly, until fragrant, about one minute. Add the yoghurt, and spinach purée. Stir, and bring to simmer, allowing the flavors to blend, about five minutes. Gently fold in the paneer cubes. Turn off the heat and stir in lemon juice. Your delicious palak paneer is ready to be served! 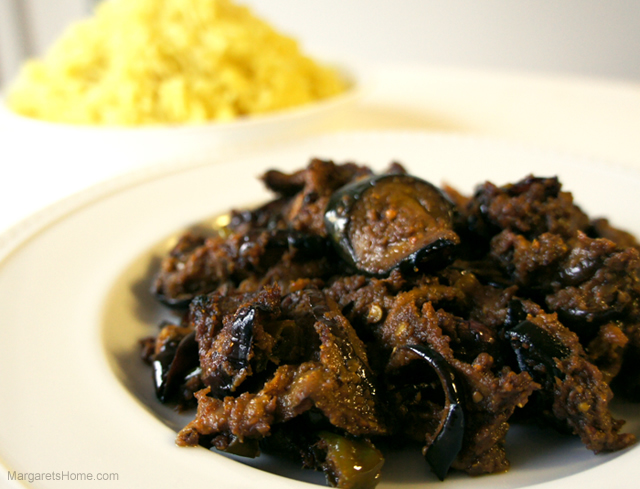 Eggplant (brinjal) sambola was a dish I first tasted when I was in college, lived in the girls hostel, and ate at the cafeteria. Needless to say, there was much to be desired in the meals we were served. Many of us brought different types if Indian pickles, sambola and other preserves which we shared with each other during our meals. It helped the food go down! This reminds me of the song, “Just a spoon full of sugar makes the medicine go down.” But, it wasn’t that bad! Sambola is often made with lemon, chilli, tomato, onion, and fish. My friends from Sri Lanka introduced me to eggplant sambola. Here is my version of this delightfully sweet, sour, and spicy dish. Cut eggplants into thin slices and rub salt and turmeric on them. Set aside for 30 minutes. Drain liquid and dry eggplant slices with paper towel. Heat oil and fry eggplant slices over medium heat till brown. It takes about one minute per side. In a blender add mustard seeds, onion, garlic, ginger, and vinegar, and blend to a smooth puree. Soak tamarind in hot water for about 15 minutes. Strain and keep the extract. Heat about three tablespoons of the same oil used for frying eggplant slices. Add mustard, onion, garlic, ginger, and vinegar puree and fry until it turns light brown. Add coriander, chilli,and cumin powder. Fry for a minute. Then add cinnamon, green chillies, tamarind liquid, and sugar. Finally add the fried eggplant and simmer for eight minutes. My ancestors are natives of Kerala, a state in India often called, “God’s own country”. Kerala is located on the Malabar Coast of south-west India. Many words come to mind when I think about Kerala – beaches, forests, waterfalls, backwaters, houseboats, paddy fields, fish, coconuts, pineapples, cashew nuts, jackfruit, mangoes, bananas, festivals, grandparents, and Amma and Papa. Tucked away in my heart are numerous delightful memories of family vacations in Kerala. My parents grew up in Kerala and later moved further north to Pune, where I was born. 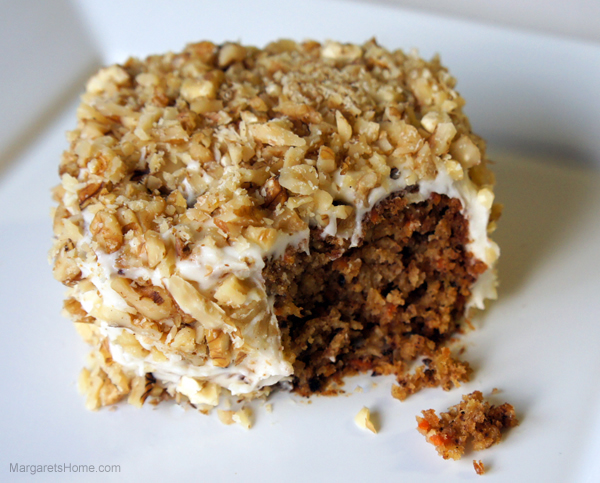 Today, I am sharing with you a recipe for fresh coconut-carrot cake, as an ode to Kerala. The carrots help to keep the cake moist. Other ingredients include pineapple, walnuts, cinnamon, and cream cheese. I have not tasted a better coconut-carrot cake, if I do say so myself. The combination of flavors and textures is absolutely scrumptious! Grease and flour a 13”x 9” baking pan. Preheat oven to 350 degrees F. Sift flour, cinnamon, baking soda, and salt. In the large bowl of an electric mixer, fitted with the paddle attachment, beat eggs. Add oil, buttermilk, sugar, and vanilla. Beat until well mixed. Add flour mixture, coconut, pineapple, walnuts and carrot. Mix on low speed for one minute. Pour into prepared pan and bake for 55-60 minutes until cake tester comes out clean. Cool for 15 minutes and then invert the cake onto a wire rack to cool completely. In a large bowl of an electric mixer add butter, cream cheese, and beat until fluffy. Add confectioners’ sugar, one cup at a time, and mix on low speed until smooth. Stir in vanilla. Frost cake and decorate with walnuts. Refrigerate until the frosting sets.